The Taoglas FXP14R Hexa Band Cellular Antenna with Integrated AntD� Resistor covers all world-wide 2G/3G bands (850 / 900 / 1700 / 1800 / 1900 / 2100 MHz). Common applications are in GSM / CDMA / DCS / PCS / WCDMA / UMTS/ HSPA / GPRS / EDGE. 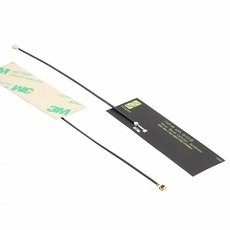 The antenna has been designed using a super thin flexible polymer substrate with a rectangular form-factor and cable connection for ease of installation. The antenna radiates well on different plastic materials and thickness. We have selected ABS plastic mounting with 2 mm of thickness as a baseline for testing. Best in class efficiency on lower and upper bands (above 40%) make it an ideal antenna for devices where space for onboard SMT cellular antennas is not available. The antenna is mounted via automotive quality 3M 467MP adhesive and has excellent reliability. The FXP14 has its own ground-plane, therefore it does not need to connect to the ground-plane of the main-board of the device for improved radiation efficiency.